The new Bridgestone HF1 irons (bottom) and HF2 irons (top) offer different levels of forgiveness. Bridgestone irons have typically targeted better players, but the new Tour B JGR line offers playability for all skill levels. The new HF1 ($849) and HF2 ($899) models are perfect examples. According to marketing manager Zack Kupperbusch, they're designed to provide "super-game-improvement" and "game-improvement" performance, respectively. The HF1 model, which Kupperbusch calls a "game enjoyment" iron due to its ease of use, is made for higher-handicappers and features a 1030 forged construction with a deep, hollow cavity, variable face thickness, plentiful offset and a very low CG location for extra help getting the ball airborne, even on off-center hits. Bridgestone's HF1 irons are made for higher-handicappers and features a 1030 forged construction. A wider, anti-dig sole rounds out the HF1 design, which comes standard in 6-PW with UST Mamiya Recoil graphite shafts. 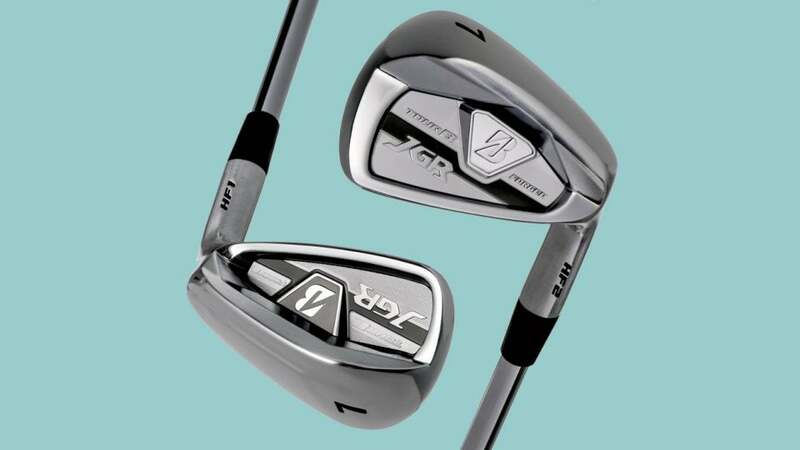 For anyone not sure if they're a super-game-improvement player, Kupperbusch describes the HF1 golfer as one who "may not know exactly how far they hit their 7-iron, but who wants to hit the ball higher and longer more easily." Bridgestone's HF2 irons feature 1025 forged construction and will suit both mid- and low-handicappers. The HF2, which comes standard in 5-AW with True Temper XP95 steel shafts, features a 1025 forged construction and will suit both mid- and low-handicappers. With a very thin face for added ball speed and a polymer insert for reduced vibration and enhanced feel, the HF2 also has a thinner sole—a boon to shotmaking. A "power slit" designed to increase COR and speed on shots struck low on the face is also built into the club, but the clubhead retains a traditional profile at address.